Business on THE ENVIRONMENTALIST: Economic Stimulus, Part 1: 16% Green? Economic Stimulus, Part 1: 16% Green? o Is the package green enough? o Is it visionary enough? o Can the beneficiaries handle the money? I’ll offer some thoughts on each of these questions in a three-part post, starting with the green issue. First, it’s important to understand is that the White House has the fundamentals right: The stimulus package must do more than spark a short-term boost to the economy. It must invest in the nation’s mid- and long-term economic security – and that security must be based on a new energy economy that reverses the growth in greenhouse gas emissions and weans us from our dependence on fossil fuels. That is the first intelligent energy policy to come out of the White House in a decade. 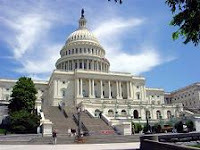 As Congress finalizes the stimulus packages proposed by the Obama Administration and House Democrats, Job No. 1 is to keep that enlightened strategy intact. Job No. 2 is to make the package greener. There are a couple of reasons a greener stimulus is important. First, renewable energy industries are America’s next IT revolution, with critical benefits for national security, economic stability, new industries and new jobs. In the past couple of years, we’ve seen unprecedented investments in wind and solar power worldwide. The U.S. wind industry set a record last year, installing enough generating capacity to serve more than 2 million homes and pumping $17 billion into the economy, according to the American Wind Energy Association. In the short term, the availability of project finance remains a major stumbling block, with growth expectations rapidly deteriorating as developers find it more difficult to obtain financing. From a stock market perspective, we therefore expect the sector may well underperform in early Q1 2009 and possibly into Q2 2009…but we expect a strong rebound thereafter. Central to climate change investing in 2009 will be the interplay with the depending economic downturn. We see two forces at work – a strengthening strategic tailwind in favour of clean energy, set against a worsening financial and economic downdraft. Which will dominate is likely to depend on the extent to which climate change and sustainability are built into government plans for economic recovery. Second, the stimulus package should send a concrete and timely signal of America’s leadership on climate action. The size and nature of our investment will have not only economic impacts, but political impacts as we approach the international conference in Copenhagen this December, where nations will attempt to reach a global accord on climate action. The stimulus signal will be especially important if Congress does not approve an effective form of carbon pricing this year. Without a carbon tax or carbon trading, the U.S. commitment to climate action will have to be demonstrated with a number of more discreet policies and investments, which in aggregate have sufficient throw-weight to show that the United States is taking moral and material leadership. What signal does the current stimulus package send? On January 19, HSBC Global Research issued an analysis of the economic stimulus packages passed or pending in 15 nations, including the United States. It found that these countries plan to invest more than $3 trillion to stimulate their economies over the next decade. Only about 14% of that amount will be invested in green technologies – defined by HSBC as low carbon power, energy efficiency, water treatment and pollution control. The amount of green investment ranges from 0% in Poland (a country stubbornly dependent on coal) to 69% in South Korea. China plans to dedicate 34% of its stimulus package to green initiatives; the stimulus package approved by the European Union invests 14%. Overall, HSBC calculates, about $432 billion is earmarked for green investments among the 15 nations it studied, with about 50% of that amount expected to be invested in 2009. The United States? By HSBC’s calculation, 16% of the proposed $825 billion stimulus package targets green investments. One of the key questions Congress must ask, and answer quickly, is whether that’s sufficient stimulus for a new energy economy and sufficient evidence of U.S. leadership. Put another way: How much of our children’s money will we spend on life-support for the old carbon economy and how much will we invest to build the new one? Again, the answer requires more than a near-term economic calculation. Our own scientists tell us that we already are locked in to irreversible damage from climate change. The U.S. stimulus package is the first opportunity for the Obama Administration and the 111th Congress to make a substantial down payment on adapting to those inevitable changes and to keeping them from becoming immeasurably worse. By my reckoning, a 16% share of the stimulus package is not enough. As it puts the final touches on the stimulus bill, Congress should substantially increase the green investment, in part by making sure that every relevant element of the package gives highest priority to reducing carbon emissions and our dependence on fossil fuels. For example, our investment in “shovel ready” road and bridge projects should take greenhouse gas emissions into account, lest we dig ourselves deeper into carbon debt. In a study commissioned by the Presidential Climate Action Project, the Center for Neighborhood Technology concluded that reducing vehicle miles traveled with mass transit and more intelligent urban planning is just as important as new vehicle technologies and fuels in reducing carbon emissions. Yet current federal policy rewards pollution by basing transportation funding on road miles, fuel consumption and vehicle miles traveled. Under current policy, the federal government pays 80 percent of road projects but only 50 percent for mass transit projects. In this case, as in many others, federal spending is moving us down the wrong road. Radical change is what we need now in federal spending. A green revolution to a new energy economy – with all of the financial security and new jobs it would create – should be the core goal of the stimulus package.